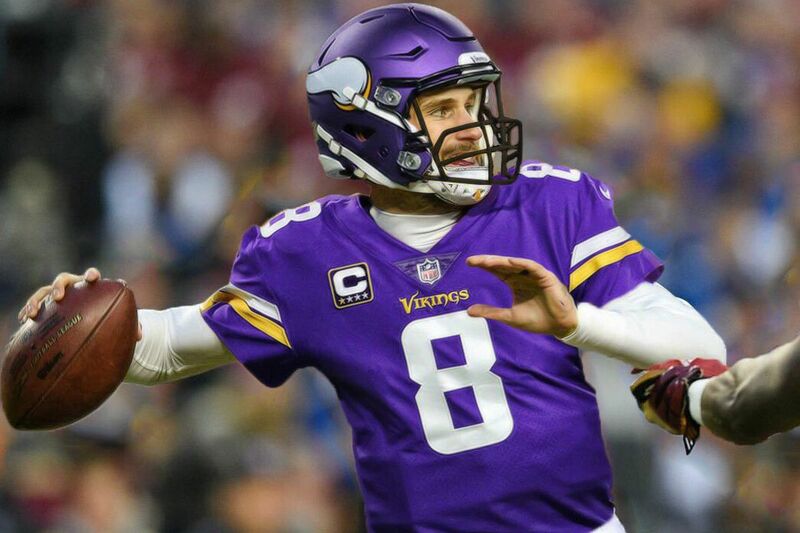 Kirk Cousins has signed with the Minnesota Vikings on a three-year, fully-guaranteed mega-deal worth $86 million. Cousins lands in what we deemed his “ideal fantasy football fit,” and we’re ecstatic at the implications. With a strong and accurate arm, magnetic leadership qualities, and strong durability, Cousins has all the makings of a potential franchise QB. He’ll now be in the perfect spot to prove this in Minnesota. Cousins’ three year stats since taking over for RGIII have been prolific — on par even with Aaron Rodgers. He’s thrown for over 4,000 yards and 25+ TDs in all three starting years, despite some severely limited weaponry. Which is why I’m so excited for this landing spot. The Vikings drip in offensive firepower. Adam Thielen is among the league’s smoothest route runners, is deceptively fast down the field, and consistently finds the soft spots on a defense. Meanwhile, Stefon Diggs has flashed elite traits in all three seasons, at times putting the entire passing attack on his back for 10+ reception games. He’s a gym rat and pure lover of the game, thus working on his craft nonstop. Kyle Rudolph is enormous yet can fly down the seams. Dalvin Cook is dangerously explosive in the receiving game out of the backfield. Simply put, Cousins will be equipped with the most firepower of his young career. DeFilippo himself has consistently talked about crafting game plans alongside his QB, operating solely what his signal-caller sees as strengths. With this amount of weaponry and the ideal coach / play caller, Cousins could approach 5,000 yards. The aforementioned Thielen, Diggs, and Rudolph all see up arrows in light of Cousins. He’ll be the best signal caller, by a sizable margin, that these three have ever had throwing to them. “The number one thing is to create explosive pass gains and explosive run gains. And how do you do that? You do that by putting your best playmakers in space and in positions for them to make plays. I think you’re going to see our players move around to a bunch of different spots. I think you’re going to see us pre-snap move and shift some. Thielen and Diggs will thrive in this model. Both guys are smooth-as-butter type of route runners, equally adept at breaking tackles and making plays happen with the ball in their hands. Moreover, both can challenge teams deep, as well as be moved all over the formation. The two will both be in line for 1,000+ yard outputs with health. Meanwhile, Rudolph receives a major stock up arrow. First, this offense should frequent the red zone even more, allowing him to use his massive frame and ball-hawking skills to rip down scores. Whether the soft Jordan Reed or Vernon Davis replacing him, Cousins consistently targeted his TEs in the red area, even if they were seemingly covered. Also, between Zach Ertz and Trey Burton in 2017, DeFilippo comes from a tight-end heavy scheme, especially sending their guys vertical ad splitting them out wide. Again, Cousins thrived with a similar mold in Jordan Reed. Rudolph doesn’t have quite the athleticism as these two, but he’s not far off. A major uptick in yardage and TDs should not surprise anyone. “Personally, I loved Dalvin Cook coming out of that draft, I loved him. I knew he was a very special player,” DeFilippo said on Friday. All reports suggest Cook should be ready, “better” even, for OTAs. Yes, a toned down workload can be expected, as the team wants to preserve Cook for the playoffs. This will, unfortunately, likely involve the short-yardage and goal line touches after Latavius Murray thrived here while filling in. DeFilippo himself saw the value of a committee while in Philadelphia. With Jerick McKinnon expected to depart to greener pastures, expect Cook to eat up all receiving work and the majority of early down touches. Even with Murray vulturing goalline and some early down work, Cook could be a total yardage monster alongside Cousins. He’ll constantly find himself in space, and is a true threat for 60+ receptions given his QBs tendency for dump offs. The Vikings were already one of the league’s top offenses in 2017, ranking 10th in total yardage and 11th in scoring. Both Kirk Cousins and new OC John DeFilippo are capable of sending this unit towards the top five. Cousins himself will be surrounded by the best weapons of his early career, and will also learn under a coach who brought along Carson Wentz to MVP levels while squeezing a Super Bowl MVP Performance from Nick Foles. Cousins should be considered a QB1, with an equally high weekly floor and ceiling. Meanwhile, both Stefon Diggs and Adam Thielen will thrive alongside Cousins and under DeFilippo, who promises to get his playmakers in space to rip off big plays. Both guys dominate after the catch, yet can still get behind the defense on any given play. Cousins will deliver the mail more accurately than ever before. Kyle Rudolph will also benefit from the increased scoring chances, as well as Cousins’ tendencies to target tight ends in the red zone, particularly on “throw-them-open” routes. Lastly, Dalvin Cook‘s receiving upside is now monumental, even if he loses goal line touches to Latavius Murray. All-in-all, this is the perfect marriage of the right QB, for the right surrounding talents, for the right schemes. Everyone is a fantasy winner here. Free Agency is firing along at a record pace. Be sure to follow us on Twitter or Instagram for news as it breaks, and don’t miss our debut episode of the Roto Street Rundown: Free Agency Edition.